Merry Christmas and all the best of health and happiness in the coming New Year! The last work days of the year are upon us, as both our places of employment prepare to have their holiday vacation shutdown. We look forward to the time off. At this time of year, we pause a moment to look back at our busy year and we are amazed at how fast it has gone by. Most of all, we’re grateful for the time that we have been able to share with our family and friends. Both our jobs are doing well and we get to spend our spare time doing things we enjoy. Can’t ask for much more than that! Peter & Mary Clukey wishing you the best this season has to offer. It is with a heavy hearts that we said goodbye to our friend Tasha tonight. On Monday evening when we got home from work, we found her in distress from bloat (for those not familiar with this: http://pets.webmd.com/dogs/gastric-volvulus-bloat-dogs-life-threatening-emergency). We took her immediately to our vet and surgery was performed, and then she was transferred to an emergency vet for overnight monitoring which our vet could not provide. She fought valiantly and pulled through a rough few post-op days. We thought that we might have dodged the bullet when the emergency vet released her, but within hours of coming home troubling changes were seen. And the downward spiral began. It was just too much to ask. When we adopted Tasha 8 years ago, she was a troubled girl with behavior issues. We turned her around into a dog that those who met her, even the vet staff, became quite fond of her. She was even been invited to neighborhood parties! We have fond memories now. I’d like to share a few. One I have of Tasha’s gentle side that, at the time I couldn’t believe that I was witnessing. A 10/11 year old autistic child approached her (this was in the early days of ownership, when we were still working some of those behavior issues) and I was quite cautious when “strangers” approached. Tasha was the most relaxed (almost tranquilized look to her face) that I had seen her up to that point in a strange public place with strangers…when the child hugged her, she gently leaned into the embraced and closed her eyes. That day I started to see her differently. She had a soft spot for children. Hope there are plenty of sheep, an abundance of cookies (that don’t go to your waist), maybe even a squirrel or two, and no more aches & pains anymore! Bolo took 1st place in the trick contest at the Top Dogs Pet Boutique Paw Festival in Kennesaw. Taking Bolo to theses types of events is a bit like wearing a sparkling evening gown into a department store… he gets noticed. We have been invited to do an obedience demo at an event in October and I thought that this would give us a nice opportunity to practice with the distractions of loud-speaker announcements and dogs of all shapes and sizes. Bolo is such a pleasure to take to these types of events. He demonstrates a stable temperament, sound body, and willingness to work under just about any condition asked of him. It is so nice to show the average person what a German Shepherd Dog is supposed to look like and act like. 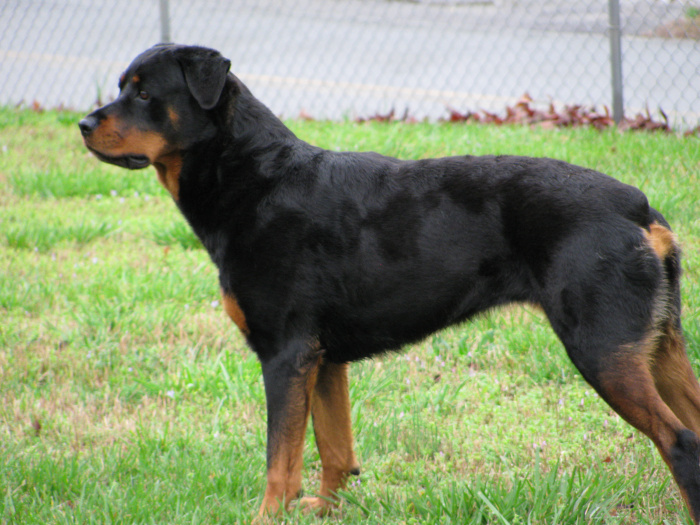 Most people there asked me what he was mixed with; as they are familiar only with the washed out, over angulated, and often with poor temperament version bred most often here in the US. I explain to anyone who asks and everyone who will listen about the requirements of the breed survey… most are simply amazed that a dog would be required to do so much… I tell them that a GSD should be a working dog first! We attended a French Ring trial and Tasha earned a CSAU. OK, what the heck is that you’re asking? Here is a description: http://www.ringsport.org/the_csau.htm. We had a fun time. And we got to watch some highly trained dogs earn their ring titles. 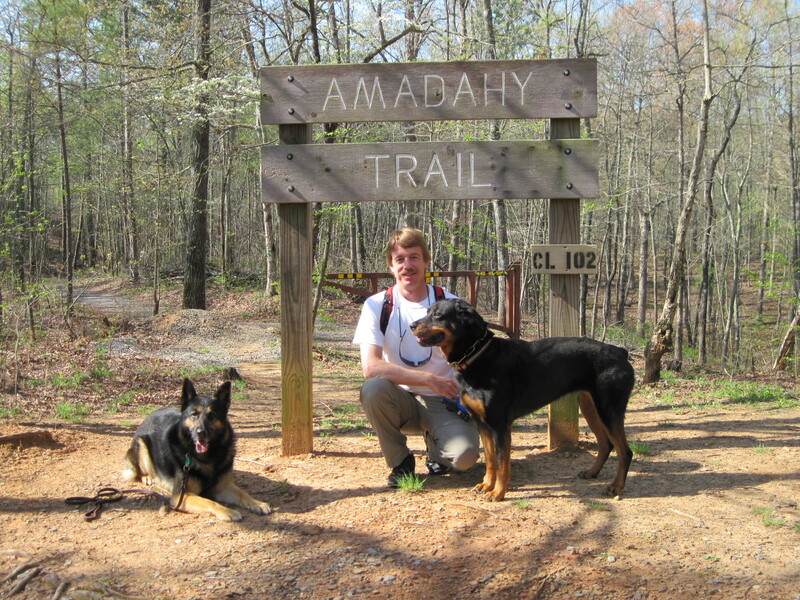 The club members of the Atlanta Working Dog Club made us feel welcomed. It was a good day. There is even one of Bolo having his tail measured for the longest tail contest… there were several Great Danes and a Burmese Mountain dog, so Bolo didn’t medal in that competition. I wish I had taken my time to stack him in the GSD pose, but oh well, everyone was just impressed that he didn’t move a muscle while the measurement was going on. We took the dogs hiking this morning. What normally is a fairly easy 3.5 mile loop hike, was made rather challenging in places by large trees that blocked the trail. We had some bad storms a few weeks back, and looks like this area really took a beating. One of the members of CMSA, Scott, brought along his video camera and captured Tasha’s second session in the pen with the sheep. He posted it on YouTube here: http://www.youtube.com/watch?v=nGw05-NKkWA Thanks Scott for the video! At the end you can really see that Brian, the instructor, was getting Tasha to work the herd. Today was a fun day for Bolo & Tasha. They got to go play with sheep. Several members of the Coal Mountain Schutzhund Association took their dogs to The Canine Ranch for a Herding Instinct Test. All the dogs tested, showed their willingness to work the sheep and will receive their “Instinct Testing Certificate”. The photos have been uploaded here: http://clukey.phanfare.com/4885413 In some of the photos it may look like the dogs got a little rough on the sheep, but no sheep were hurt during this event. Their thick hides, wool, and the talent of Brian, the trainer, protected them from any damage from the dogs in training. A few of the dogs did, however, suffer cut pads and sore muscles from being over exuberant chasing the stock. This past weekend, Rucker’s Horse and Pet had their annual Doggie-palooza event this weekend. The Coal Mountain Schutzhund Association (represented by my friend Tammie with her dog Deuce and Bolo & I) and Forsyth County K9 Unit gave demos to entertain the crowd. Photos are here: http://www.clukey.phanfare.com/4865139 It was a difficult venue for the dogs to perform in. However, both Deuce and Bolo handled it very well, strutting their stuff hardly noticing the 200+ attendees and their yapping dogs of all different varieties. Mary & Bolo’s weekend of fun! I spent this last weekend up in Dunn, NC competing in the South East Regional Championships. And while it didn’t quite go the way I envisioned it, it was a blast. The host club was great, the competitors fun, the crowd was wonderful and the weather… well, the week leading up to the trial was full of rain and the club trial field suffered from the deluge. Bolo and I didn’t make it to the podium but I came away with a lasting memory and the Sportsmanship trophy. I drew track number one… apparently this is the track number that everyone wanted including the soon to be crowned Regional Champion, Joni… I however would have rather had a later track number, so I could ask competitors questions about the judges quirks… every judge seems to have them. Tracking conditions: dormant coastal Bermuda (brown), about an inch tall in sandy soil. On one side of the road/driveway the field had puddles, the other side was dryer, and a field a little distance away was the better of the three tracking areas. We had at least two track layers. Also, it was a bit breezy. So, first out. The tracking flag was about 5 feet off of a paved driveway. The judge instructed all the competitors explicitly to walk down the road/driveway… stay off the grass. Usually I would like to lay my dog down “near” the track in the grass so that he can be familiar with the ground scent. I basically had to put the line under Bolo’s leg while at the edge of the pavement, to avoid doing any obedience within the “no obedience zone”. Bolo started out well, then began some casting with the wind. He “indicated” the first article by standing over it, not lying down as he has been taught. The article was in some standing water. I dropped my line and Bolo held his position over the article, while I picked it up and showed it to the judge. On command he picked up the track, then appeared to make the turn to the left for a short distance, he then came back and circled and picked up the original track and followed it to within one foot of the woods, where it turned left. The judge called the track off, as he was sure that the track layer would not have gotten us that close to the woods… when I went to pull Bolo off the track, he dug in pulled me harder down the track, at that point I could see foot prints. I told the judge that there is a track there. He said, lets see… and as the track layer walked his track to pick up the articles… sure enough Bolo was correct. So, we were granted a re-track. As the morning went on, three dogs failed tracking. The three dogs that failed tracking had the same track layer. The wind also picked up as the morning went by. From first to last dog to track. Honestly this track is a blur to me. It was a reverse “P” in shape. Bolo did a lot of casting and circling, never quitting though. He found and indicated all articles by correctly lying down. Turn three was the biggest problem for Bolo. The judge was patient, allowing Bolo to work through the track and he complimented me on my handling skills. Butch England said that I had “nerves of steel” on that track. We survived the day with a score of 79. After the tracking phase, out of seven Schutzhund III dogs, only four were left in the running for the podium positions…. that was soon to change. By the time we got back from tracking, the Schutzhund I & II obedience was under way. It was followed by the Schutzhund I & II protection. ….Some say this field was cursed… dogs were failing left and right in all phases. It was challenging for sure. The champions were tested and found worthy! The Schutzhund I & II dogs were tracking in the morning and the Schutzhund III’s were schedule to start obedience at 10:30 am. The husband of one of the Schutzhund III competitors was a Schutzhund II competitor… and one vehicle meant that they could not be at the tracking field and at the trial field at the same time. As the tracking dragged out past 11 am, those at the trial field (myself included) grew anxious to get this show on the road. The decision was made to start (out of “draw night” order) with those competitors ready at the trial field. I was in the first set of dogs to go, paired up with Floyd Wilson and had to do the long down first. Bolo held the long down until Floyd’s #2 exercise, he sat up then laid back down… by exercise #4, Bolo had enough and broke the down… minus 10 points – ouch! Heeling off leash was beautiful as we swished and sloshed our way through the field. The condition of the field was swampy. There was about an inch of standing in water in most places, unless it had been repeatedly walked on then it was mud. The judge was very accommodating and moved the “center line” for heeling to the highest driest place that could be found. He also gave the competitors the option of choosing their go out line (center of the field or the new heeling center line). Sit out of motion was a stand (Bolo was not going to get his bottom wet), minus 5 points… down out of motion was a stand, minus 5 points… stand out of motion was a stand with 6 steps, minus ??? points… retrieve on the flat was beautiful. I think we got full points for that. Retrieve over the jump… no jump, beautiful retrieve… more points gone… Retrieve over the a-frame… scaled the wall on the way out, but went around it on the way back… bye-bye more points. Now as I am preparing to set up for my go out, the judge comes over to console me and Bolo thinks its party time. Bolo jumps up and clocks me right in the nose. Yup, I get a bloody nose on the field before my routine is done. Everyone is so nice and brings me some ice and napkins out on the field. Within a few minutes the bleeding is stopped and the judge allows me to do a little obedience with Bolo to prep him for the go out. We set up for the go out and have a decent build up, Bolo goes out fast but not far enough before he stops and looks back. The judge signals me to down him. He does go down saving a few points to add to our dismal morning. We walk away with 59 points, a lasting memory and some wonderful comments. The judge was impressed with Bolo’s enthusiasm and speed in the retrieves; he was surprised that Bolo was a six year old dog. Many in the crowd complimented me on Bolo’s attentiveness and for my courage continuing after the nose incident. So, then there were three left vying for the podium positions. And we weren’t one of them. But, we were still having fun. The judge kept the morning line up for protection, so I was second up. Bolo and I had just a wee bit of trouble with the blinds on this field. And Bolo “searched” only three of them. His hold and bark was convincing. The call out was fast but not close (a carbon copy of the call out from his Schutzhund III trial last spring). I gave him too harsh of a down command for the escape and he downed, but immediately got back up and circled around me back into fuss position (it wasn’t pretty), I gave him a second but kinder down command and he complied. He stopped the escape. The routine begins to become a blur here in my memory. I do remember that every time that I approached he regripped the sleeve, but then immediately let go without command. He forged (though I didn’t think badly – I could feel him leaning on my leg) on the back transport. The distance was correct and he quickly stopped the attack. Heeling down field was not beautiful. He did not leave me but he was wide and thinking about going to the helper. On the courage test, he came fast and did not gather before launching into the long bite. The judge commented that all grips could have been calmer. He was unruly on the side transport… he went to the front of the helper and I had to pick him back up and start the side transport again. At the report out the judge instructed me to leash my dog and “do not let him regrip” before the judge instructed the helper move away from us. Slight control issues were surfacing. Our score was 82. All I really wanted was to get on the road home (7 hours away waited a warm shower and my comfy bed), but there was the awards ceremony to watch and participate in. I was instructed to get my dog for the photos. What a photo this would be, dogs and competitors covered with mud up to their knees. It was truly a test for the champions this weekend. There were five FH entries, only two made it to the podium. The FH Champion is Lord z. Lipin, handled by Richard Shook, with 96. Nine Schutzhund I teams entered, only two made it to the podium. The SchH1 Champion is Remo XXIII, handled by Nona Luth, with 96-75-94=265. Four Schutzhund II teams entered, only two made it to the podium. The SchH2 Champion is Ace Von Stone Haus, handled by Robbie Stringer, with 87-75-90=252. Seven Schutzhund III teams entered, only three made it to the podium. The Schutzhund III South East Regional Champion is Alin vom Meulenwald, handled by Joni Gynp, with 91-88-88=267. The final trophy to be handed out was the Sportsmanship award. This award is giving to the competitor who though faced with adversity showed overall good sportsmanship… completing a routine after a near knockout and bloody nose qualifies as good sportsmanship. Who knew, all I had to do was bleed a little to get a beautify trophy for my mantel!?!?! I got a nice hug from the obedience judge and a round of applause from the crowd. I just hope that wasn’t my 15 minutes of fame. I really imagined something quite different for that 15 minute time slot. Well, it was a challenging weekend, I learned a lot from it and even had a little fun!